Home » carlos49's booth » Oil 3.oz Arnica mix Ginger Rollon. 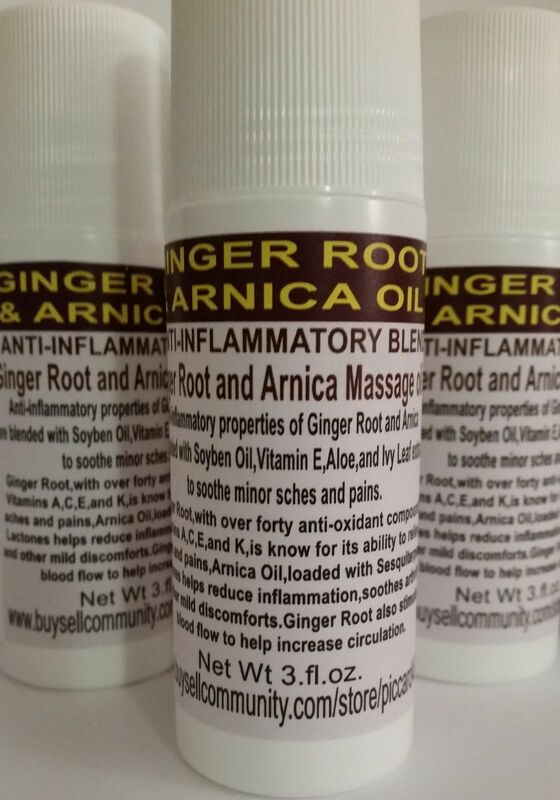 Oil 3.oz Arnica mix Ginger Rollon. GINGER: Massage this soothing, aromatic smelling oil into the skin for just about every kind of ache or pain - Headaches, back pain, insect bites, rashes, burns, this basic first aid healing oil is a wonderful natural alternative to over the counter drugs. Replace all those bottles and jars of medicine with one simple remedy. Use this healing and anti-inflammatory formula to stimulate help alleviate muscle aches, joint pain and soothe skin irritation. ARNICA: relieve muscle aches and stiffness, swelling and discoloration from bruises. Arnica has decongestant and antiphlogistic properties and is a blood circulation activator. Its use is suitable to treat bumps, sprains, contusions and bruises. Menthol is a painkiller used to treat neuralgia and inflammation of the mucous membranes of the nose. Plus Maharayan Oil. 29 diferentes aceites mesclados en rollon.